three quarters: 16 cups or 4 pounds of raw onion become four cups of caramelized onion! A heavy-bottomed pan is best, it holds the heat, creates a barrier from the direct flame and cooks the onions evenly. Heat up the pan, pour in a couple of tablespoons of olive oil, slide the sliced onions into the pot, add 2 teaspoons coarse salt and stir to combine. 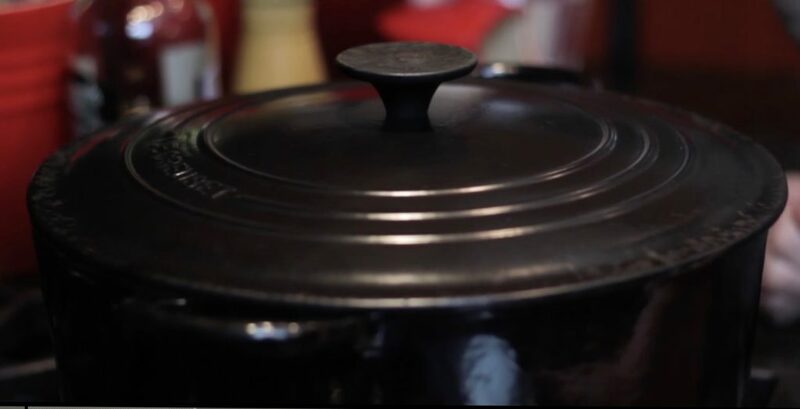 Cover the pot and sweat over medium heat, which allows them to expel some of their natural water content and soften. Because of the amount of onions, sweat for 10 minutes, stirring three times. It isn’t always necessary to cover the pot to sweat vegetables, but because of the volume of onions, it makes the process go a little faster. Fill a measuring cup with cold water and place it next to the stovetop. Remove the cover, raise the heat to medium-high and continue cooking, stirring occasionally, to evaporate the water. This may take another 15-20 minutes. At this point the natural sugars in the onions begin to stick to the bottom of the pan creating a fond – that delicious brown caramelized sugar that gives color and flavor to food. 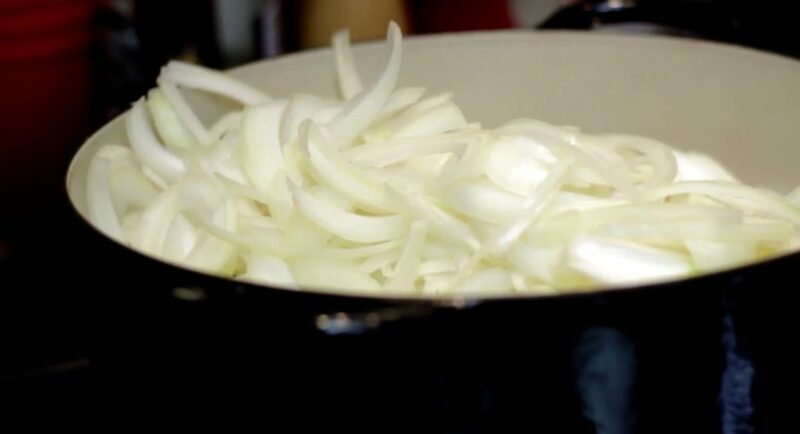 This happens quickly and adjusting the heat and deglazing the pan with a little cold water occasionally to dissolve the fond and incorporate it into the onions are essential to prevent burning. Once the onions are soft and golden in color, remove from the heat. These four cups of onions are just the right amount for French Onion Soup. Other uses for caramelized onions are omelets, mashed potatoes, topping a burger or sausage sandwich. Add a little vinegar and a pinch of sugar and make an onion jam! Caramelized onions freeze well. Freeze in small amounts for various uses in the future. 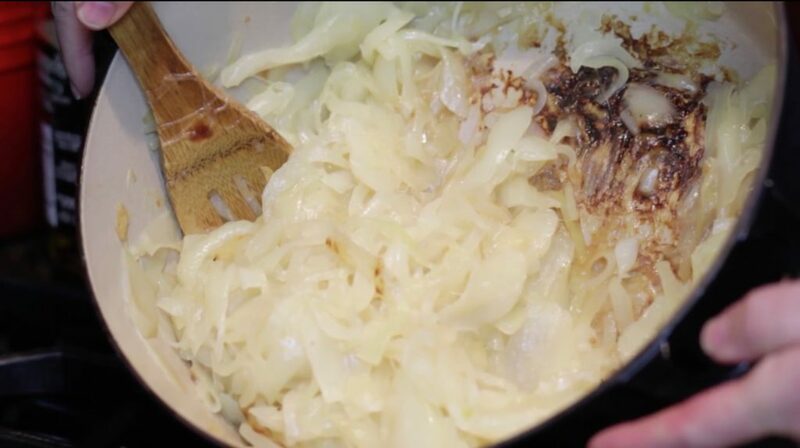 It’s not a complicated process to caramelize onions, but it does require your full attention. 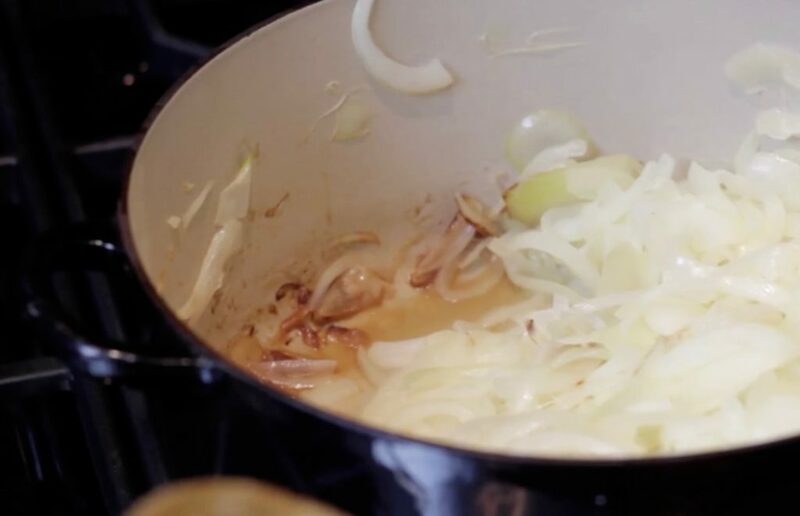 Don’t be alarmed by the number of onions this recipe calls for, once the onions are cooked, they reduce by three quarters: 16 cups (4 pounds) of raw onion become four cups of caramelized onion! A heavy-bottomed pan is best, it holds the heat, creates a barrier from the direct flame and cooks the onions evenly. Other uses for caramelized onions are omelets, mashed potatoes, topping a burger or sausage sandwich. Add a little vinegar and a pinch of sugar and make an onion jam! Caramelized onions freeze well. Freeze in small amounts for various uses in the future. Heat up the pan, pour in a couple of tablespoons of olive oil, slide the sliced onions into the pot, add 2 teaspoons coarse salt and stir to combine. Cover the pot and sweat over medium heat. When we sweat vegetables, it means we’re simply allowing them to expel some of their natural water content and soften. Because of the amount of onions, sweat for 10 minutes, stirring three times. Fill a measuring cup with cold water and place it next to the stovetop. Now remove the cover, raise the heat to medium-high and continue cooking, stirring occasionally, to evaporate the water. This may take another 15-20 minutes. At this point the natural sugars in the onions begin to stick to the bottom of the pan creating a fond – that delicious brown caramelized sugar that gives color and flavor to food.